This is an Azerbaijani variation of minced lamb meat kebab - other similar versions include lula kebab in Armenia, and kofte kebab in Turkey, among other variations. This dish is typically prepared by grinding or chopping the meat together with the onion. It is then grilled on skewers. I do not have a functioning meat grinder nor a grill, so this recipe is modified to accommodate my kitchen. I made the kebabs by frying them in a pan. I divided the meat in approximately 12 meatballs, which i then rolled out between my palms into sausage shapes. I then fried them in two batches. This version of the kebab is typically served wrapped in flat-bread (called lavash, traditionally made in a tandoor type oven). If this flat-bread is not readily available you can substitute with another thin flat bread such as flour tortillas or even naan. A pita might not be a good substitute as it is too thick, but if you'd like to make a gyro out of it, go for it. I could not find any lavash (one of my next projects is to learn how to make it), so I used regular flour tortillas. They go very well with this dish. Another essential ingredient are onion slices. I marinate them briefly by mixing them in coarse salt and let stand for about half an hour and then add a touch of rice vinegar. The salt softens them and the vinegar gets the onion stink out to make them palatable as a topping. Another thing you will need is sumac. As I mentioned in my last post, sumac is a spice common across the Middle East and Central Asia. For this Azerbaijani inspired dish, it is almost essential. It adds a tangy flavor and a beautiful reddish color. For these kebabs, it is used both as an ingredient and a finishing spice. Serve the kebabs with garlic-yogurt sauce and red chimichurri sauce for dipping. 1. First, marinate the onion slices that will be served with kebabs. Take 1/2 of the onion and slice thinly into crescent moons. Put the white onion slices in a bowl, and mix them with 1/2 tsp coarse salt. Let stand to allow the onions to become moist, about half hour, then mix with the teaspoon of vinegar. Set aside while you make the kebabs. 2. Mix lamb, minced onion, 1 tbsp of olive oil, sumac, cumin, paprika, coriander, cinnamon and salt and pepper until combined. Divide into 12 even pieces and roll each one into a meatball. Using the palms of your hands, roll out each meatball into a sausage shape (about Italian sausage size). 3. Heat remaining 3 tbsp of olive oil in a large pan over medium heat. Cook the kebabs, turning frequently to allow even browning, until the kebabs are done and no longer pink, about 15 minutes. 4. To serve kebabs (you can bring everything out and allow your guests to do it themselves), wrap each one in a flat-bread, top with marinated onions, springs of cilantro and mint, pomegranate seeds, sprinkled generously with sumac. Serve with garlic yogurt dip (recipe follows). Combine yogurt, garlic, herbs, and salt and pepper. Squeeze juice of 1/2 lemon and mix well. Refrigerate until ready to serve. I have been exploring lately with phyllo dough. Aside from being the base for delicious baklava, the dough can also serve as a base for more savory treats. You may already be familiar with my slight obsession with various versions of meat-based pastries. The Sigara Boreks are a Turkish meat pastry consisting of savory filling (here made with lamb, although they can also be made with cheese and other fillings) wrapped in phyllo dough. Borek typically refers to any dish made with a flaky dough. Sigara boreks in particular are made to look like a little fat stuffed cigar, hence the name Sigara. As typical with many foods and recipes, this dish transcends geographical borders. Versions of borek dishes appear in Eastern Europe, Israel, the Caucuses, and the Middle Eastern regions to name a few. This version is made with lamb meat. If you cannot find ground lamb you can use beef or ground turkey, but the flavor will not be the same. The slight pungence of lamb works well with potent spices used in the filling, including cumin, cinnamon, coriander and sumac. To make the boreks, precook the filling first. Then working with a single sheet of fully thawed phyllo dough you will brush it lightly with olive oil and fold it in half. Turning the short side towards you, place the filling towards the edge closest to you. Fold the edge closest to you over the meat, and fold over about half an inch of the long sides. Wrap the borek away from you like rolling up a rug (I am doing this backwards in the photos because my husband was taking the pictures to show the process better). Place the finished borek on a baking sheet and brush with oil. You can sprinkle some poppy or sesame seeds on top for decoration. A note on sumac. Sumac is a spice common across the Middle East and Central Asia. It is derived from a plant and adds a tangy, lemony flavor to dishes. It can be used as an ingredient or a finishing spice on meats, as well as on side dishes and salads. Its reddish-burgundy color can add a nice contrast to a dish. It is subtle, and it can complement many different dishes and cuisines. I've been putting it on pretty much everything lately. It may be available in supermarkets with a large or specialty spice selection, or specialty food stores. I managed to find one at Whole Foods (it was the last one). These boreks can be served as a snack or an appetizer. They go particularly well with a garlic-yogurt dip or tzadziki sauce and a red chimichurri sauce (I could not find any so I used some spicy jarred salsa instead). 1. Defrost phyllo dough according to directions. Preheat oven to 350F and line a baking sheet with parchment paper. 2. Heat 2 tbs olive oil in a pan. Add onion and cook on medium heat until fragrant and slightly transluscent, about 1 minute. Add the meat, paprika, coriander, cumin, pepper and sumac and mix well. Season with salt. Cook until the meat is browned and no longer pink. Place in a bowl and allow to cool slightly to allow you to work with it. 3. Place the phyllo dough on parchment paper and cover with another sheet of parchment paper or paper towel to avoid drying. Place a sheet of phyllo dough on a dry working surface, short edge facing you. Brush the sheet lightly with olive oil (not heavy brush strokes, but as though you're making a provisional sketch on a canvas). Fold the sheet in half and turn so that the short edge is facing you again. Place about 1 1/2 tbsp of meat in a line about 1/2 inch from the edge, leaving enough room on each side to fold it. Fold the edge facing you over the meat. Fold over the long sides of the sheet to allow the meat to be tucked in. Roll the borek away from you like rolling up a rug. Place on a baking sheet with the outer edge tucked under. 4. Repeat with the remaining filling and sheets, eyeballing so that you have about 20 or so boreks. Brush the tops of the boreks with a little olive oil. Sprinkle with sesame or poppy seeds. Bake for 25-30 minutes until golden brown. Serve warm. Baklava, a crispy, nutty, syrupy treat, is enjoyed in a number of countries across the Middle East, Central Asia and the Mediterranean, with a few variations by region. Making it isn't difficult, but perhaps slightly time consuming. The end result is well-worth the effort and far fresher and better than any pre-made baklava that I've had. The layered phyllo dough sheets are buttered and interlaced with nuts and are baked first without any syrup. Once baked, the baklava is soaked in syrup for several hours, so be sure to make it earlier in the day or the day before serving. Baklava is typically very sweet, with the syrup loaded with sugar, so that people will rarely brave more than one piece. In this recipe, I made the syrup using dark brown sugar and a bit of lemon juice, along with honey. The end result is slightly less sweet, with the taste of honey more prominent. When purchasing your nuts be sure they are not salted (I had a hard time finding unsalted roasted pistachios). Chopped pistachios also make a great garnish by creating a nice contrast if you sprinkle a few bits on top. 1. Defrost phyllo dough according to package instructions (usually a few hours on a counter or overnight in a refrigerator). Preheat oven to 350 F.
2. Chop nuts on a cutting board until finely chopped (1/8 inch pieces or less), or grind them in a coffee grinder until coarse. Mix nuts with cinnamon, coriander and cardamom and set aside. 3. Melt butter in a saucepan until liquid. Remove dough from packaging and lay it on a parchment paper. Trim the dough so that it will fit in your baking dish. Cover the dough with another parchment paper so it will not dry out. Brush the bottom of your pan with butter lightly. 3. Working quickly, lay one sheet of phyllo dough into your baking dish, brush it lightly with butter. Place another sheet on top and brush with butter. Repeat until you have 8 sheets. Sprinkle about 1/4 of the nuts in a thin single layer, then cover with one sheet of phyllo dough and brush with butter. Repeat, until you have 8 sheets, then top with 1/3 of the remaining nuts. Repeat again, layering 8 sheets brushed with butter, then topping it with 1/2 of the remaining nuts. Repeat with another layer of 8 buttered sheets, and top with remaining nuts. Cover with remaining 8 sheets, brushing each with butter. With a sharp knife, cut your baklava lengthwise and crosswise on a diagonal to have about 32 pieces. Bake in the oven for 1 hour until golden brown. 4. To make the syrup, combine honey, brown sugar, and water in a saucepan and bring to a simmer. Whisk in the cinnamon and lemon juice. Simmer on low heat for about 10 minutes. Remove from heat. 5. Once baked, remove the baklava from the oven and pour the syrup evenly over it. You will hear baklava crackling; this is good. 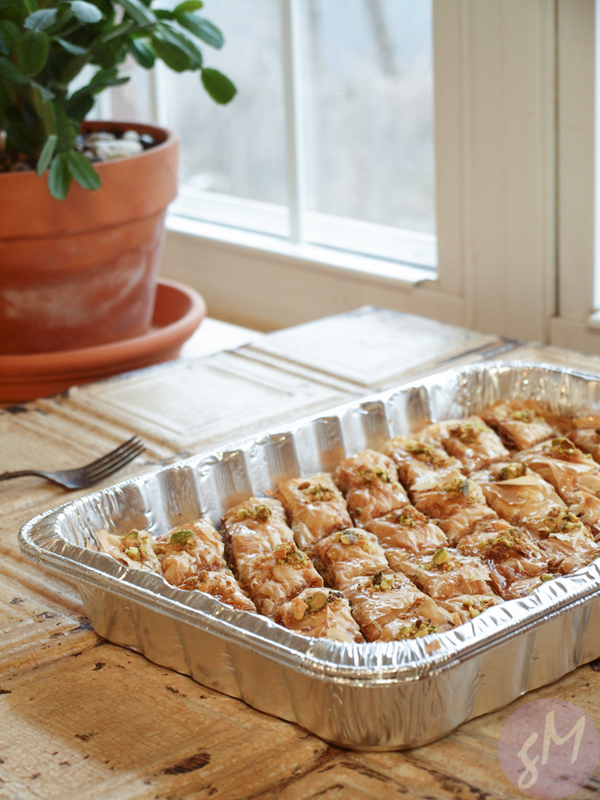 Sprinkle each baklava piece with a few chopped pistachios. Set aside for about 4 hours or overnight for the syrup to become fully absorbed (you should leave it uncovered at least for a few hours). Serve and enjoy. 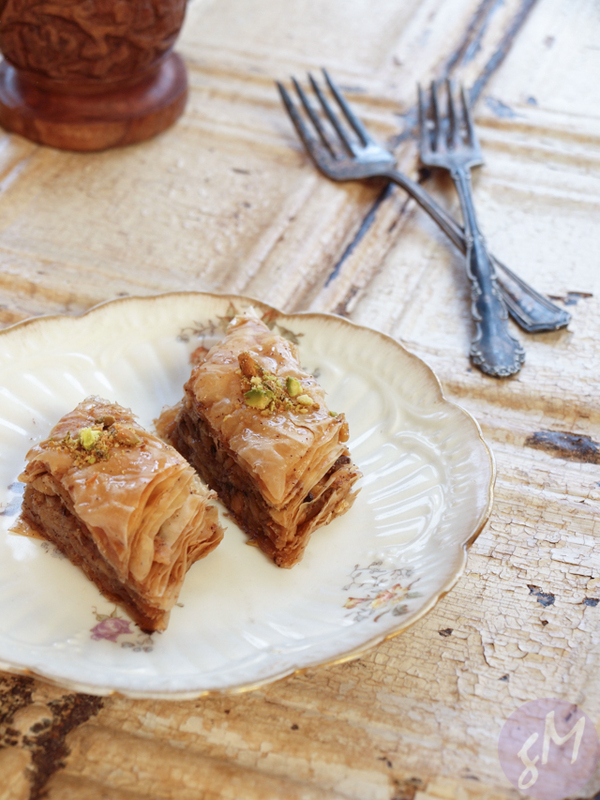 Baklava can be stored at room temperature covered with parchment paper for several days. Cold weather makes us miss the summer season as well as seafood. 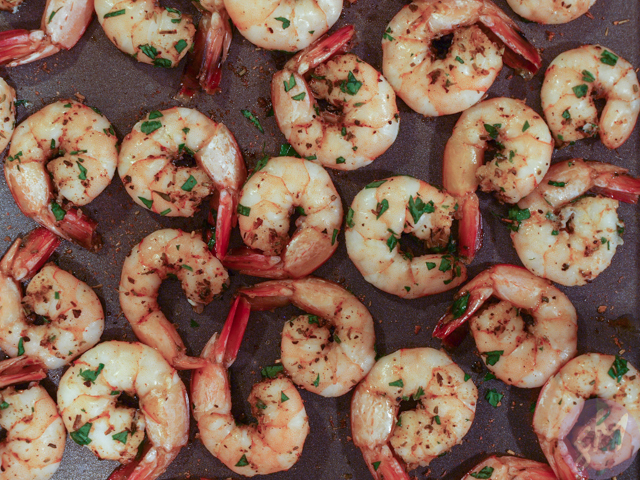 Here is a recipe for a quick and easy oven-made shrimp that tastes great in any weather. This recipe works well with seafood blackening seasoning or Old Bay. Or even just salt and pepper and maybe some paprika if you have none of these handy. Blackening seasoning tends to have more sugar and less salt than Old Bay and therefore can be used generously, whereas if you are using Old Bay use it more sparingly. If your seasoning mix doesn't already have garlic added, you can add 1 clove crushed garlic into the mix for improved flavor. 1. Preheat oven to 400 degrees F and grease a foil-lined baking sheet with oil. If using frozen shrimp, thaw the shrimp fully. Peel and devein the shrimp. Drain of any excess water, pat dry with paper towels and place in a bowl. Pour juice 1/2 of the lemon over the shrimp and mix, then sprinkle the shrimp with the blackening or Old Bay seasoning. Add garlic if using. Add the parsley. Mix well. 2. 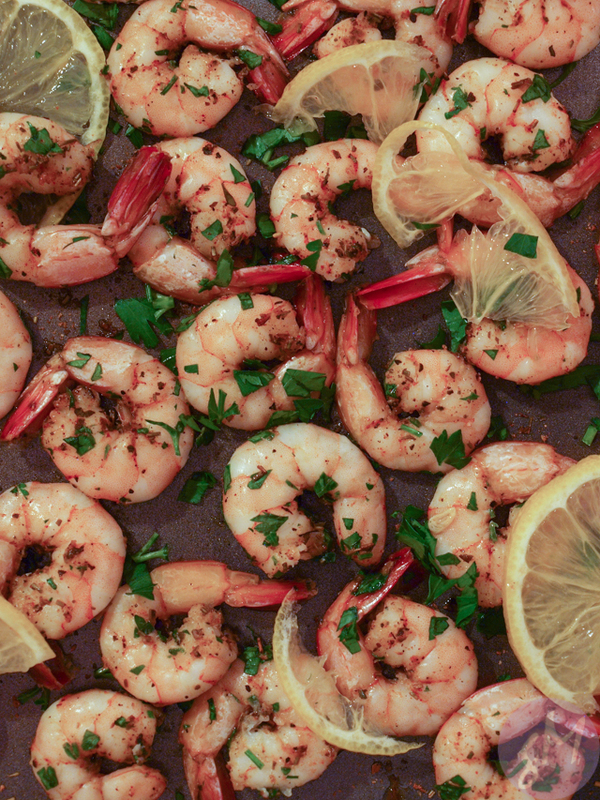 Place the shrimp in a single layer onto the baking sheet and bake until pink and cooked through, about 8-10 minutes. Serve with lemon wedges from the remaining half lemon, as well as cocktail sauce and horseradish. Or to make it a meal and serve over rice.